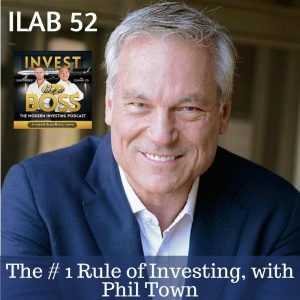 Phil Town is an investor, motivational speaker, hedge fund manager and 2x New York Times best-selling author. Through Rule #1 Investing, he teaches personal investing at a free 3-day workshop where he empowers people to invest money on their own and stop relying on fund managers to determine their financial future. Phil started in the U.S special forces and worked as a Grand Canyon river guide up until 1980. He fell into finance in such a unique way and managed to turn $1,000 into over $1 million in just 5 years. Find out how Phil’s methods contributed to all of his success in life and investing. Listen to ILAB 52 on iTunes here or subscribe on your favorite podcast app. 32:53 – Is accessibility to the market bad? 38:31 – Should you play the market crash? 1:00:24 – Do you need a financial advisor?